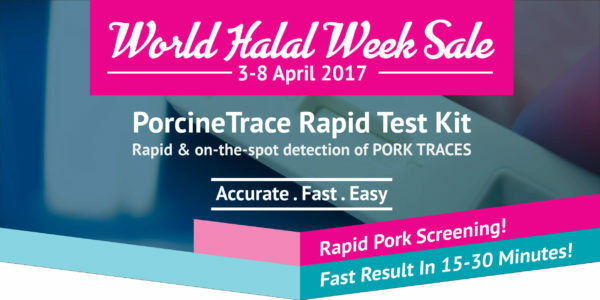 Joint collaboration with eHalal.com, 7FoodPillars will be showing latest range of PorcineTrace Halal Detection Kits at MIHAS 2017 from 5-8 April 2017. Welcome to meet us at Hall 2, booth no. C36-C38 & C45-C47 and schedule meeting with our team. See you at MIHAS 2017! Hurry, don’t miss the opportunity to grab the special World Halal Week Promotion below! Limited time offer of PorcineTrace Rapid Test Kits from 3rd – 8th April 2017! Fantastic saving on7FoodPillars PorcineTrace Rapid Test Kits – specially designed for fast screening for pork in Raw Meat, Processed Meat/Canned Food, Gelatin & Surface when you purchase qualifying kits as below.